Are you a serial tissue carrier? Having allergies can mean more than the sniffling and sneezing that most people associate with it. Red, swollen, itchy eyes may also be a significant sign of allergies that can come, whether you are sneezing uncontrollably or not. Allergic conjunctivitis is the scientific name for this condition. It is caused, like any allergic reaction, by a mistaken triggering of your body’s immune system. Allergens such as pet dander, pollen and dust, usually harmless, can cause your immune system to “panic”, triggering this negative reaction! 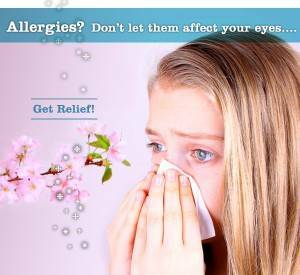 Allergic reactions release a chemical called histamine, which makes your eyes dry out and produce more tears. This reaction is meant to flush out foreign objects. The blood vessels in your eyes also become inflamed, which is what gives your eyes their bloodshot look. Many things may cause an allergic reaction. Grass, weed and tree pollen, as well as dust and pet dander are among the best known allergens. Less well known is that it is also possible for a person to be allergic to everyday items such as makeup or perfume, and even contact lenses. Also not well known is that, while it is very common for allergic symptoms to come out immediately upon contact with the allergen, it is also possible for an allergic reaction to present itself as much as four days after original contact with an allergen. Several other ways to reduce or relieve symptoms exist as well. Wearing sunglasses when stepping outside helps block pollen, dust and other outdoor allergens from getting in your eyes. Contact lenses may also irritate your eyes, so try taking those out if nothing else works. Finally, never rub your eyes while experiencing an allergic reaction. No matter how much they itch, rubbing will irritate your eyes further and make things worse. For more information, and for help clearing up your eye allergies, contact the caring eye care professionals at Flagstaff Vision today. Call (928) 216-5800 or click here to request an appointment. They are ready and waiting to assist you!